Let your imagination run wild with our flawlessly crafted staircases. The drama of a glass staircase allows your imagination to run wild. If you’ve been looking for impactful design ideas for to bring your London home to life, our bespoke glass staircases will respond perfectly to your aims. Tailored to your precise specification, our luxury glass staircases will act as a stunning focal point wherever you decide to place them in your home, while at the same time improving its market appeal. Our glass staircases won’t just look good from every angle; they’ll reward you with clearer views of the room in which they’ve been sited. They will also improve light distribution when optimally situated, resulting in a space that’s lighter and brighter. Glass staircases installed by Finepoint add more than just visual value – they’re practical too. Complete the design of your new installation with a stunning glass railing that will add a vital finishing touch to your new staircase. We will be able to advise on all aspects of the design too, so that it ties in with the themes and schemes of your London home. To find out the glass staircase cost for your project, please contact our friendly team for more details. Having reviewed examples of glass staircases online, you’ve settled on a design that suits your design requirements. You now need to find a trustworthy company with the product knowledge and experience needed to complete the work – quickly, but without compromising on quality, and at a price that will fit within your allocated budget. Our innovative approach – and extensive industry experience – enables us to respond to projects of varying complexity and scale. 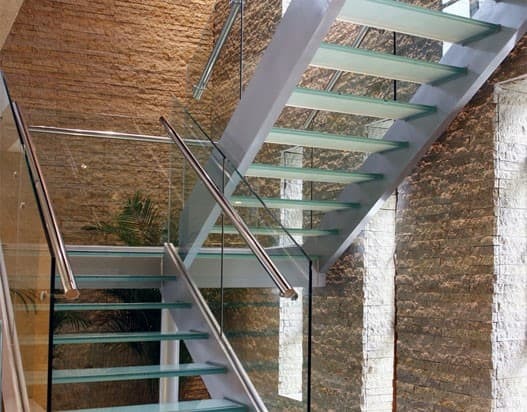 Our in-depth knowledge of glass staircases means we’ll be able to recommend the right products and the best approach, then complete the work in line with your specifications and without causing disruption. Finepoint installs glass staircases for residential and commercial customers throughout the UK. You can complement your installation with a decorative glass railing and explore our range of products –including structural glass, innovative glass and bi-fold doors – by browsing our website. If you have a question or need to estimate a glass staircase cost, please contact us. Our glass staircases are growing in popularity throughout London and the UK. Find out why by exploring just a few of their benefits below. Wherever they’re installed, glass staircases make an impact. They act as superb focal points and as a talking point for visitors. The unique design of your staircase – offset by a glass stair railing, perhaps – will add a sense of architectural presence to your interior and increase the market appeal of your London home to buyers. Glass is easier to clean than other materials. Our staircases are no exception. Compared to traditional designs, your new installation will accumulate minimal dust, which means you won’t need to devote much time to their upkeep. Instead, you’ll be able to sit back and enjoy the many benefits of your new glass staircase. Our glass staircases are made to measure. Built to your precise specification, they’ll be the right size and fit into place seamlessly. We’ll also make sure the right products are used throughout the design, so there aren’t any surprises when we arrive on site. All work will be completed within the timescales we agreed with you. We understand that price is important. You want your installation to look outstanding and add practical and market value to your home or business – but without exceeding the budget you’ve set aside for the work. We’ll locate a design solution that works for you on every level before work begins so that you can explore our range of glass staircases with confidence. Our bespoke glass staircases are designed and built using the latest technology. Each product is built at our in-house at our factory in Watford, which is open 24 hours a day – meaning we can respond to instructions from our commercial and residential customers quickly. Examples of our products can be viewed at our showroom for your further information and peace of mind. To obtain a glass staircase cost for your commercial or residential project, please get in touch with Finepoint Glass today.